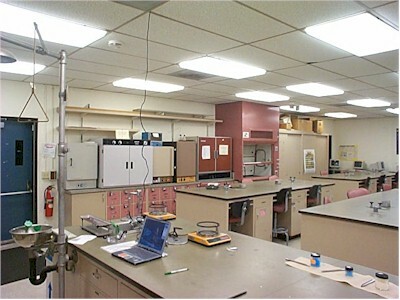 This lab is empty because we're between semesters at Miramar. Actually, I took the photo last semester, on May 8th, after all of the students had left. They're going to construct a new science building for us in the next year or two. That will be nice. Right now, the hood you see is somewhat blocked by one of the bench positions; just one of many inadequacies here, including the lack of shelf space. We share this room with the biology department, which is somewhat worrisome to us chemists, as there could be anything crawling around on the tables when we arrive. Once my lab followed an anatomy class and I walked in to find a cadaver laying on the front table. I said to myself, "I hope that's the last dead person I see in my chemistry lab!"